Torres del Paine in Chile is the cherry on top of the Patagonia experience for most hikers. It’s hard to top the ice field, horn and tower-like rock formations, and the ever changing landscape from day to day of the trek. I’ve hiked the O Circuit in Torres del Paine twice now, and it’s one of my favorites in the world for the physical challenges, the harsh but stunning landscape, and the number of ‘wow!’ moments. The bus that brings you to the park will stop at the headquarters where you pick up your permits and sign in. Next there will be several other buses that make several stops, including the Welcome Center and the Hotel Las Torres, where I started. You can also get off on the last stop and do the Q trek, or take a boat to the Grey Glacier and start from there. There’s no right or wrong place to start. Personally, I knew that I wanted to do the entire O trek and preferred to finish with the Torres, so I started at the Welcome Center. If you’re unsure whether or not you want to do the whole thing and want to test the W (the shorter trek) first, you can get the boat over and hike to Refugio Grey. But if you’re toying with doing the full O Circuit, you really should! Also keep in mind that if you’re hiking the O you can only go in a counterclockwise direction, whereas those on the W can go both ways. If you’re doing the O, or just considering it, make sure you’re going counterclockwise. Some of the most beautiful parts of the trail are on the part of the trail that the W doesn’t cover. Some say it’s even the best part of the whole trek. Yes, you have to get over the John Gardner Pass, but the reward of hiking next to the Southern Patagonian Ice Field all day is so worth it. You’ll get views that most people who visit the park don’t see. The trail is much less crowded on the back end of the park, and the refugios have a more intimate feel. The camaraderie with the other hikers is easier to come by because there are fewer people on the trail. You tend to meet each other, talk, hang out, and get to know each other before joining the masses on the W.
Convinced yet? Don’t worry, you can do it! Torres del Paine has increased in popularity by 30% year over year. If hiking during high season, you would be wise to book camping spots ahead of time, which you can do in town or on Fantastico Sur and Vertice Patagonia. This wasn’t necessary when I went at the end of March but in January and February, definitely look into it. 4. Refugio, Rented Tent, or Backpack? When booking your campsites you’ll have the option to just reserve a spot where you’d pitch your own tent, a place in a refugio, which are limited, or tents that are already pitched for you. The last option is typically a package deal that also includes all of your meals. Which should you go for? You’ll significantly lighten your load without having to carry food, camping, or cooking equipment. You don’t have to set up the tents, and they’re generally nice and big. The sleeping bags were actually pretty clean and comfy. The food is pretty good at most of the refugios, though some were much better than others. If you opt for the fixed tent rentals rather than the refugios, you have more options for where to sleep, especially Los Perros, which is the closest camp to the John Gardner Pass. Otherwise it’s simply too much to attempt from Dickson to Grey in one day. It would be over 30km! The biggest downside is the cost. If you bring your own gear, you’ll be paying about a quarter of the price. You can always opt to eat some of your meals in refugios to decrease your weight, but also keep in mind they will serve guests first, so it’s not always guaranteed that you can eat in every refugio. It’s tempting to bring a normal tent from home, I know, but a typical dome tent does not fare well in the wind in Patagonia. The last thing you want on an 8-day trek is to end up with a tent you can’t use, so get one that is good in heavy winds. I used an MSR tent and it worked great. The key is the sturdy but light tent poles, which will hold up in the wind but won’t weigh you down tremendously. Every ounce counts when you have to carry 8 days worth of provisions! Get travel insurance that covers hiking. This basic package covers hiking under 3000 meters (this trek is definitely under that). There is no search and rescue in the park, and this will cover you if you need extra help getting out should you experience an injury. Don’t believe anyone who tells you that running shoes are just fine to use in Torres del Paine. The trail is very muddy and rocky, and some ankle protection plus a waterproof shell are both important to keeping you dry and blister-free. Remember to lace them up tight and get some nice thick socks as well! This is the pair of boots that I recommend and these are the socks I suggest. *If you do get blisters, Compeed is a really helpful blister bandage. It’s sweat-proof, so each one can last a couple of days. The wind on two days of the trek in Patagonia literally lifted me up and slammed me forward, it was so strong. My hiking poles saved my face by helping me with balance. They also help tremendously for going downhill, especially if your knees tend to bother you on long hikes, or if this is the first one you’re attempting. Like with the tent poles, sturdy but light ones are great to have along. Cheap ones break quickly. These are the ones I used. A rain cover isn’t very useful in Patagonia. Due to the wind, they either blow right off or make tons of noise in your ears as the wind runs through them. Since the wind seriously does reach 100km/hour and over, they can blow right off and then become litter in the park. Nobody wants that! The solution is to line your backpack with a bin liner/trash bag and to wrap everything inside in its own bag as well. It’s okay if the backpack gets wet. It’ll dry out in the wind and they’re made to be resilient. The stuff inside will stay dry with the double bag protection. Happy days! I know that’s not very exciting, but in all seriousness, cans, packaged sauces, and anything that creates a lot of waste will be heavy and annoying on the trail. Food is the heaviest item on an 8-day trek, so it’s essential to cut weight wherever possible. There’s so much water available everywhere along the trail, flowing from every glacier and stream, so buying things that just need to be rehydrated works best. It’s also helpful to pack lunches that don’t need to be cooked that you can snack on while moving or during short breaks. I’d suggest fruit and nuts. They pack lots of energy and calories for their weight. You can buy all of the food you’ll need in the shops in Puerto Natales. I urge you to shop at the small, independent grocers and split your shopping between a few stores. There’s even a dedicated fruit and nut shop with dried mango and melon! 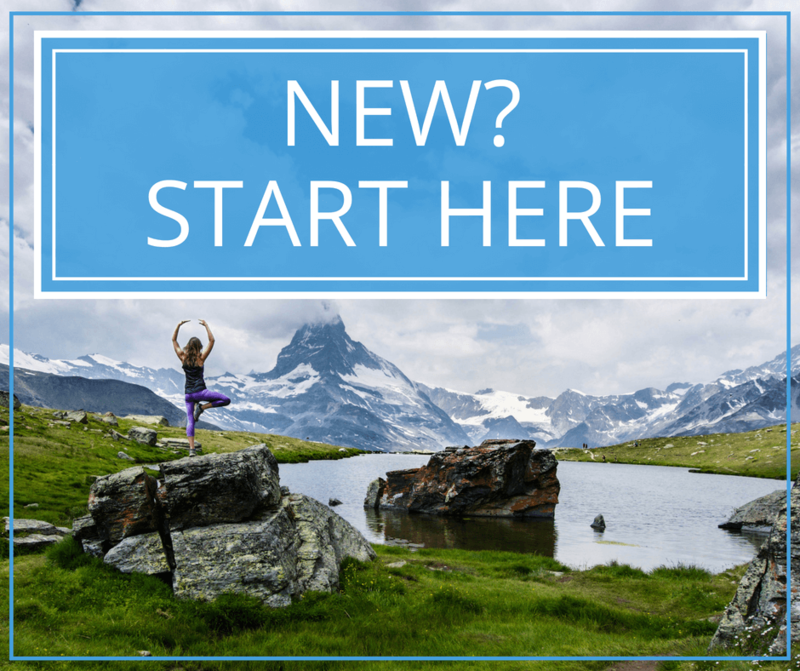 Only 2 changes of clothes – one for hiking and one for sleeping (yes you will wear the same nasty hiking clothes each day – there’s no point in bringing more clothing because the new stuff will get sweaty and smelly within the first five minutes of your hike anyways). However bring one extra pair of socks and enough underwear for the trip. 1 small and lightweight sleeping bag. These can get costly, I know! But you will want something that doesn’t weigh much and can keep you warm in sub-zero temps, which you might encounter on the trek. 1 SteriPEN – the amount of park visitors has been increasing by 30% year over year. People don’t always respect the rules around water (i.e. : no bathing or washing directly in the streams) and some people have gotten sick from the water at Campamento Torres. You can avoid any issues by sterilizing your water. Something to put water in. I chose a CamelBak. I also brought along my camera, of course, and several extra camera batteries. You can find out more about my camera equipment here. You can lighten your load by eating at some of the refugios. The food is great at Refugio Dickson, in particular. You can also buy some supplies as you go along. Don’t count on it, but know that it’s often possible to get more food and snacks if necessary. Some camps have nice, hot showers that you can use along the trek. It’s much easier to get some shower time in the less crowded camps that are not part of the W, though some of the larger refugios on the W part have more bathroom options. I’ve seen a huge difference in the size of the refugios and availability of restrooms and showers since the first time I did the trek. Everything is growing and the facilities are only getting better. My absolute favorite shower was at Frances, and the worst is still Los Perros, which is cold and not worth it! The free camps don’t have amenities like showers and sometimes don’t have toilets that flush, but they’re typically in really beautiful settings (and they’re free!). How many days should you spend on the trail? How long will it take you to complete? I’ve done it two ways, spending 8 days hiking and 9 days. In both cases, the day that I crossed the John Gardner Pass was the longest, most exhausting day. The big difference between the two was splitting up the day that followed into two the second time around. The days on the back end of the O are pretty long, and you never really know what kind of weather you may get, so a buffer can be a good idea just in case. I personally am always happy to spend more time in nature, but if you’re pressed for time, you can do it all in 8 days. We can’t talk about backpacking in the wilderness without discussing leaving no trace. The biggest issue right now in Torres del Paine is erosion of the trails. It may not seem like a big deal, but ‘social trails’ left by people trying to avoid mud can cause irreparable damage. Unless I’m going to get totally soaked or covered in mud, I step right in the mud and keep going. My shoes are waterproof so it’s no problem, right? Never wash dishes, clothes, or yourself in rivers. It has to flow to somewhere, right? Take water at least 200 feet/61 meters away first. Please only use the bathrooms on the trail unless it’s an absolute emergency, and always pack out your TP. Don’t swim in the rivers or lakes. It’s prohibited in Torres del Paine. I know that you might think I’m crazy for suggesting this, especially after the long hike to get to the camp at the base of the Torres, but it’s so worth climbing up to the top twice if you have time – once in the afternoon and once in the morning for sunrise. If you can’t get reservations at Chileno for the final night, you may not have much of a choice. Nobody is allowed to attempt to hike up after 3pm. This is to make sure nobody camps up there, which is fair TBH. However if you run out of time, you can always make it back up for the morning from Campamento Central or Chileno. My tip for avoiding the crowds is to go up while it’s still dark before the sun rises. However I would NOT recommend this alone and if you do decide to go, it’s best to go with someone who has already been up there. I led a group up to the top and it’s good that I already knew the way. When it’s dark all you have to go on are the reflective markers. That said, we got to the top around 5am to see the Milky Way going right through The Towers and nobody was there yet. Most people show up throughout the day starting with the sunrise. 11. How Hard is the O Really? 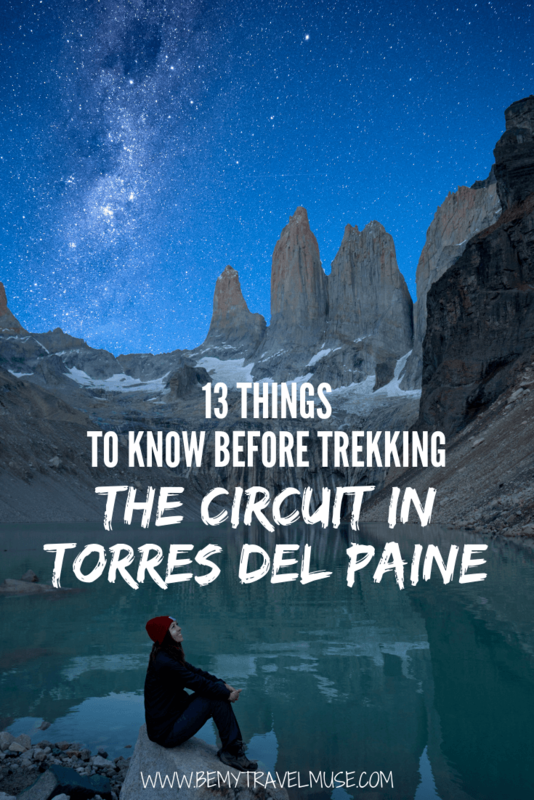 It’s hard to rate the difficulty of a trek, since such things are subjective, but I’d say the O Circuit in Torres del Paine is a moderate trek. Some days are pretty long, however, and you’ll be on your feet for most of the day, which can be exhausting. The hardest part for me is coming down from the John Gardner Pass since it’s such a long and steep downhill. Others also feel that the Torres are a tough ending as well. It takes about 30-45 minutes to climb to the base of the Torres from the Las Torres ranger station and about 2-3 hours from Chileno. It’s steep, but if you’ve already done Fitz Roy, I can assure you it’s not nearly as bad. Besides, moving keeps you warm. It was snowing when I reached the base of the Torres in late March the first time! I stayed at the Hotel Las Torres in the park right after the trek both times I’ve done it now and it was the best decision ever. The food was great (it’s all-inclusive) as were the drinks and the activities. They even grow all of their own veggies in an organic garden, which is SO WELCOME after 8 days of trail food. It’s so nice to stay somewhere comfortable for a few days after finishing an 8-day trek, and though this is definitely fancier than a tent, it’s a really welcome change. I also really liked that it included horseback riding and some treks that aren’t on the usual TDP menu (you can book a stay here). One huge benefit of staying at the Hotel Las Torres, apart from the comfort, is access to this amazing viewpoint. It’s called the Puma trek and it sits on the hotel’s property. It’s also one of the steepest and toughest treks in the entire park. We went there the day after finishing the 8-day trek and I was definitely sore after! The day after the trek I’ve done a full Paine bus tour with the Hotel Las Torres twice now, and twice I loved it. There’s just no better way to see the parts of the experience you miss from the trail. There are so many different angles and views that you get by covering more ground with the tour, and it’s a nice chance to let your body take a break, too. There are a lot of picturesque places in the park that you don’t see when trekking on the Circuit trails. The park is absolutely full of lakes of all colors, glaciers, different viewpoints, and even waterfalls. The full Paine tour also includes a boat trip to the Grey Glacier, for yet another great perspective. Most of this is accessible by car, so in lieu of renting one yourself and driving it through the park, you can take a day tour from Puerto Natales or in my case, as part of staying at the Hotel Las Torres. 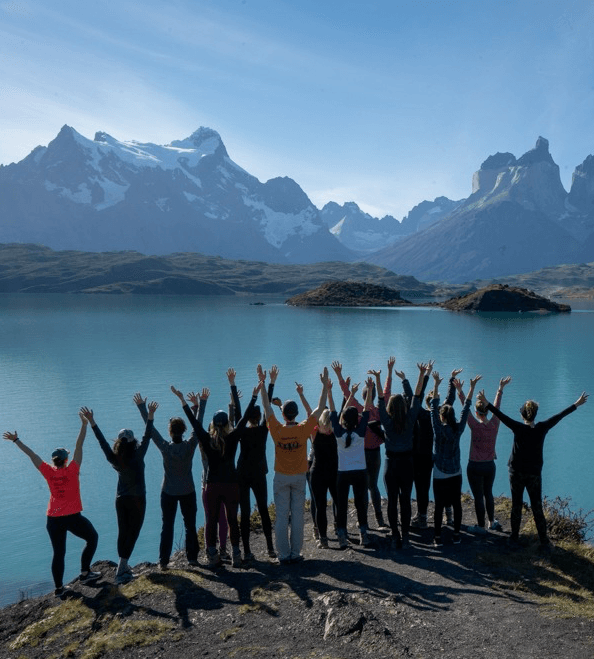 Finally, if you want to do this trek but aren’t confident doing it on your own or just want to be with a group of amazing women, I’ll be running another Patagonia tour in mid-February 2020 including a stay at the Hotel Las Torres, all of the logistics figured out for you, tents, food, and everything else provided so that you don’t have to carry it, plus photography workshops, and expert guides (like me!). You can learn more here. *Some links in this post are affiliate links. Any purchase you make through these links gives me a small commission at no cost to you. This post was also brought to you in collaboration with the Hotel Las Torres. All reviews on this site are always sincere. Wow, this looks fantastic! I’m too old to hike this but Patagonia is absolutely on my bucket list! Thanks for this really thorough guide! I’m wondering, did you rent or buy any of your trekking gear (poles, tent, etc) locally or did you bring it from “home”? Wondering if it is worth lugging camping gear around Chile for the 4 weeks I’ll be there prior to doing Patagonia. Thanks! I bought a sleeping bag, sleeping mat, and hiking poles in Chile and everything else I brought from home. I actually used the camping gear all throughout Patagonia and it would also be useful in Easter Island as well, and maybe even the Atacama desert, so it might be worth it. 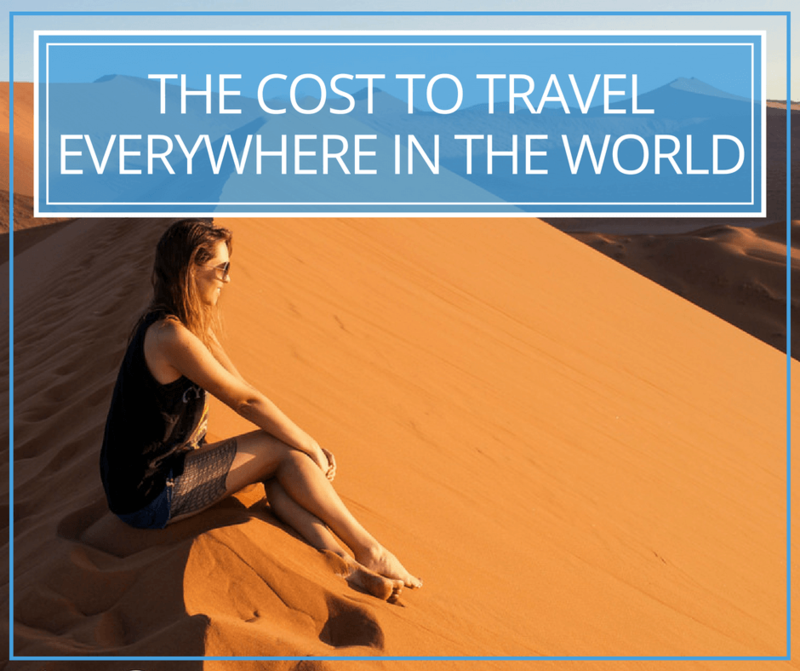 It’s not cheaper to buy in Chile and DEFINITELY don’t buy anything in Argentina! I’ve enjoyed your post very much. I am planning my own trekk to Torres del Paine an dto Mt Fitzroy. Your tips come in very handy. Thanks for sharing. Why are you saying “don’t buy anything in Argentina”? I just mean don’t buy your gear in Argentina because it’s the most expensive place you can buy it. However the currency fluctuates a lot there so that advice could change at any time. When I was there prices of things were insane. I’m now in Chiang Mai by the way, living the good digital nomad life 🙂 Anyway, thank you for all your inspiring and informative articles and photos, I can’t say how much I enjoy following your journey. Thanks for the wonderful comment, Barbora! The W is a great trek itself, and I’d definitely recommend that to anyone visiting TDP with limited time. Enjoy Chiang Mai! Oh how I miss Thai food! Thanks for the great article. This is definitely on my bucket list for next year. I was wondering though, how hard is it for a solo female to trek in Patagonia? I wish I had a friend that would come with me, but schedules never seem to work out. I’ve trekked in New Zealand solo and with friends in Nepal. Also, how much Spanish is really necessary to get around in Chile? I’m a beginner and was going to start studying it again. Good tip about the gear. I’m planning on bringing all of it with me from the US. Hey Michelle, it just depends on where in Patagonia you are because some trails are more remote and have way fewer trekkers. That said, I met a few solo trekkers (both joined me at one point) and I really feel that when you put yourself out there, you’ll find people. This was the first trip in over 3 years that I took with someone else (Steve) and before that I went to Nepal solo and met someone on the bus on my way to start the trek and we became great friends. This ain’t your first rodeo, you’ll be able to meet others. You will struggle without knowing some Spanish. I’m a beginner too and I was able to get around, but definitely keep practicing because it’ll only help you. The toughest thing for me is I can understand almost everything but I can’t respond! This looks incredible! I’ll get to do it one day hopefully and definitely using your guide (and all the others)! Thanks for the very detailed article! I have been dreaming of going to Patagonia forever…I think it is a destination on every hikers bucket list. I especially enjoyed your “after the trek” tips like renting a car for more sightseeing and staying at the park lodge. I think so too. There seems to be an endless amount of trails! I was wondering about the Puma Track that you mentioned that you did during your stay at hotel la torres. Which horse trails it it part of? I see the hotel offers several horse riding trails. Also how long would this track take to do, as I’m wondering if I can make it for the afternoon shuttle back to Natales. Do you know if the puma track is accessble to visitors that don’t stay at the hotel? thanks so much for answering my queries! Where did you get your white visor headband?! Thanks so much for your great post and for sharing your beautiful photos! I’m looking at going to Patagonia next year and I have about 2 weeks. I am trying to decide whether to do the full Torres Del Paine O or whether to do the W and couple it with a some hikes around El Chatelan as well as a visit to Perito Moreno. Am I trying to do too much? Thank you for your response and for the inspiration 🙂 I will be doing the full circuit in January next year and can’t wait! Hey, great read! I had a quick question I was hoping you could help me with. I’m headed to travel South America for a year. I want to start in Chile and the O track. Is there any place to store unnecessary gear while on the hike ? I only want to bring my essentials. But I will have other things with me for the rest of the trip that will not be needed for the O track. Any suggestions ? Thanks !!! Ask the hostel you stay at before and after for a storage room. I’ve done that in every single place I’ve ever trekked and they’ve always had a space for that. They’re used to being asked. I heard that since 2016 the CONAF limits the number of people on the circuit to 80 per day, so I have to make reservation ahead of time at the CONAF office in Puerto Natales. Did you also get the reservation? And, if you did, do you know any way to reserve it in advance in online? I’m afraid the reservation will be fulled quickly at January. I’ve heard about that, and they stopped requiring them at the time of year that I went. You might already have issues, unfortunately. I’d check in with Erratic Rock in Puerto Natales and ask if they can help you out. This article is so incredibly helpful! Thanks for sharing all your tips. I’m planning on doing the O Circuit with a friend in December and I’ve never done an overnight hike before and have been relying on great tips like this one to help. One question: where do you leave all the rest of your stuff you won’t use when doing the hike? I plan on taking just a few pairs of clothes with me to hike but have 3 more months of travel afterwards through South America. I don’t want it all weighing down my pack! We’re doing the Circuit in a month, and I saw your note about wire bag lock. Is theft an issue at the refugiosif you leave your bag in the tent, e.g. during dinner, shower etc ? Do I need to always take the essentials with me passport, camera & phone? I don’t take my bag lock trekking, though I did lock my valuables that I didn’t take hiking up at the hotel while I was gone trekking for those 8 days. This write up is awesome. I am looking at doing the 8 day trek at the end of March, and I was wondering about renting gear. You mentioned that there are gear shops that rent gear. Do you know which are the good shops? I was planning on renting a tent and a sleeping bag because I plan to visit more countries in South America, and don’t want to carry around the excess weight. And I’m not sure about purchasing the MSR tent now; it’s fairly pricey, even in the US. Thanks again. Erratic rock rents out equipment and since it’ll be the end of March, which is when I went as well, it won’t be as busy in the park and they should have stuff to rent. Hey! Planning to hike the circuit in a few weeks. I was hoping to use my 48 liter backpack and strap things to the outside. Do you think that will cause a balance problem with the wind? How big was the backpack you used? I used a 70L and yes the wind will be a big problem for things strapped to the outside. It got up to 100km per hour! This is normal there, so go bigger if you can.If you’re just doing the W and don’t need as much food you might be able to fit everything into yours. I didn’t completely fill my pack and it was 8 days worth of food and such inside. Hi, you now have to book all of your camping before you start either the W or the circuit! We only came across this in a blog a couple of months ago and really struggled. Luckily we are on a long trip and could push our itinerary back by 10 days to work around availability. Crucial info for anyone thinking about Torres del Paine! Hi Nicole, during high season that’s definitely true. That’s noted near the top of the post, and you have to get permits for the park as well (also only during high season). It’s new thing as the park has become more and more popular. Glad you were able to push back the timing and I hope you have a great time! Thanks for the article! I am hoping to hike the O circuit over 6 nights 7 days end of March but I am traveling solo and feel nervous about doing the hike alone. Did you meet a lot of people hiking end of March? How was the weather at this time of year? Is 6 nights 7 days okay if I am physically fit but haven’t done much overnight hiking trips? I’m suddenly getting nervous and am finding planning quite difficult. You won’t be alone. Plan for rain and dress warmly, which would be true any time of year but especially then as it will be getting colder, but the leaves will also start changing and that’s beautiful! I think you should give it 8 days at least. That’s how long it took me and I’m pretty experienced, and I pushed it. Thank you so much for all of this wonderful info! My husband and I are planning to hike the full circuit next December! We have one question: where is your last picture taken (the one overlooking a lake and bridge)? It’s an absolutely beautiful view, and we’d love to see it in addition to the trek! 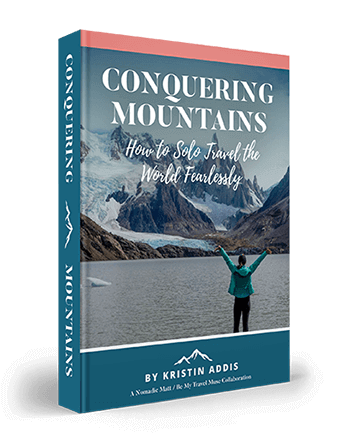 Hi Kristen – I am considering visiting Torres Del Paine alone (40th birthday!) in the second week of September this year. I wouldn’t call myself an experienced hiker necessarily and definitely don’t have camping experience. Looking at your photos, I really want to do the O, but as someone who suffers from back, neck and shoulder issues, I am concerned about carrying too much weight especially given the wind and cold. I think I’ll be fine as a single woman, but is there ANY way I can do the O without needing to carry a tent, sleeping bag and a pad? In other words, are there places where you can rent these things along the way and get someone to help pitch the tent on the spot? I guess once I get to the W part, it will be refugios all the way so I don’t’ have to worry about food and such. Yes, when you are in town before you go, stop by erratic rock and ask them to help you get reservations at the Refugios. That’s what I would do. Have fun! Great info! I checked your site and others long time ago to had an idea about torres del pain. I went to do the trekking about a month and a half ago, but we needed a guide to do the W (now is mandatory for winter season) so we went to a place called Rental Natales and the owner help us to find more people and share the cost of the guide! It was incredible! They have really good equipment also, we rented everything from there and had an amazing camping experience, we were glad that we didn’t rented from Erratic Rock like another couple, they had such as smelly and dirty equipment and they were cold most of the nights. Thanks for the info! Cool to know it’s awesome in the winter too. I’m looking into doing this hike. A lot of preparation but i like that. Thanks for the information! I got info about limited number of visitors at Torres del Paine NP, is that true? If yes, where can I buy ticket before I come to Chile..? Do I have to sleep in campground in the Torres del Paine NP or can I find my own place for tent? If I have to be on campground, can I reserve all the spots online? Can I buy all the bus tickets on bus stations one day before? I saw info about food – it´s strictly prohibited to bring my own food to the Chile, is that right? What about jerky, nuts, granola etc.? If I can´t have anything from US, can I buy everything in Puerto Natales or Punta Arenas or is even better buy everything in Santiago (I expect limited kilos in domentic flights) ..? You need a permit for TdP if you’re going during high season. I was there in March and didn’t need one anymore. As far as I know you apply for that in person. I did link info on booking camping in the post. You cannot sleep outside of the campgrounds. I bought my bus tickets a day or two before, but during high season you might want to book a few days ahead. For some companies you can do this online. You definitely can’t bring nuts and meat into Chile. I bought all of mine there and it wasn’t that expensive, plus you can support the local grocers which is a nice thing to do. Hi there! I have developed a bunch of questions as I’ve started planning my trip to Torres del Paine. I have booked my flight for December 21-January 6 and plan to complete the Circuit during that time. I’ve done solo hikes and plenty of solo traveling, but I have never done this lengthy of a hike alone. I am already using your tips to plan but have a couple questions. You somewhat touched on this in your blog, but do you think there are any issues with being a single female completing the trek? I speak Spanish well enough. Also, you mentioned using an MSR tent. I have a Big Agnes 2 person. I plan to upgrade my poles before taking the trip. Do you have any other tips for essential gear? Some guides suggest reserving an extra night at the sites to plan for perhaps not being able to complete the John Gardner Pass on the planned day due to weather. Did you have any issues like that? I also want to stay in the Hotel Torres on the last night but am hesitant to make a reservation due to the idea of perhaps falling behind a day due to weather. Thoughts? I have 2 unplanned days at the end of my hike. I really want to try to push it and head over to Argentina. Is this totally unrealistic to think I could go over there and scoot back to Punta Arenas to catch a flight? One last thing. Would you be willing to share the itinerary you followed? I thing I have it nailed down but would love to hear the route you used for comparison. I really appreciate any help or tips folks can provide. 🙂 All the best!! You could get private transport from the hotel, if you do their full package, and get a transfer right to El Calafate in Argentina in about a half a day. Otherwise don’t bother with only 2 days because you’ll have to take some public buses and it will probably not be doable in that short amount of time. I assume you want to do this in order to see Perito Moreno. It’s worth it. Thank you so much for all of the information! I am so excited and lucky to benefit from all of the information shared online! One last random question… what kind of camera/lens did you use for your photos? Read your blog a lot before I went and was awestruck with your photos. Now looking back at this (sending to a friend who’s going), all my photos look the same!! The beauty is really that capture-able!! First of all, congrats for your inspirational travel blog and for the beautiful places you’ve visited so far! I’m writing you with regards to my upcoming trip which will be in Argentina/ Chile (especially in Patagonia) where I will be traveling with my husband. We have a problem in finding accommodation for a few nights in Torres del Paine in the beginning of January 2018. We’ve started our search since October but everything is fully booked apparently. I can’t imagine though that we won’t be able to visit the park (W circuit) due to the lack of accommodation (there is a rather recent rule for visiting the park stating that you have to present when entering the park a proof of the accommodation you’ve booked). I really suspect that this is a method for driving the tourists to book private guided tours that offer a full package (including accommodation) at an exorbitant price (e.g. $800/person). Could you please help me with any advice you have for finding accommodation or a tour at a decent price? Hi Lulia, what about the campsites? I believe you do still need to reserve them ahead of time but maybe it’s still possible. Unfortunately, the park is exploding in popularity and my guess is that they truly are booked, and that these tour companies just booked out these spots way ahead of time knowing that would happen. Thanks for sharing this great post. I really loved your photos. I am traveling to Patagonia, Chile in Jan 2018 with my family and planning to hike the W Circuit of Torres del Paine National Park. I got much helpful information about Torres Del Paine in this post. I have already booked my trip with a travel company ChileTour Patagonia. This is my 1st time adventures trip in Chile and we want to enjoy a lot in that Torres del Paine National Park. I am very excited to visit beautiful places in Chile. Do you know which free Refugio I should choose to make the full circuit or I can follow your itinerary as well. Also before that, there are just silly money if you want do throw an Agency, thousand of dollars, cheers. I have gears, the only things I will rent is tents and sleeping bag, and about food I will buy everything in Puerto Natal, which in all the Refugio, it is silly money……. I did 8 days for the full O, and you do have to pay to camp but it’s not much. If you only do the W then you can manage to only do free campsites but for the O you will need to pay once or twice. If you go in mid-march, check the date, you might not have to book anything ahead of time or get a permit. I was there just after the cutoff. I didn’t pay thousands of dollars – more like a hundred or so. I had my own gear but you can rent from erratic rock. I have three weeks off in March and have been trying to figure out where I want to travel. I read this particular article awhile back and now I am debating on doing the O hike. I was wondering if I needed to know Spanish well and what website I should go to reserve the campsites? I was also wondering if it was possible to rent gear or if I am better off hauling all my camping gear with me? Depending on when you go in March you might not have to book ahead. I went towards the end and it was after the permit/booking season. It would help if you spoke Spanish but it’s not necessary in TdP. There is enough tourism that you can easily find English speakers. You can also rent gear at Erratic Rock. It’s Sydney again. I am trying to book the rest of my campsites through Vertice Patagonia and their website isn’t allowing me to see if their availability. I have emailed and facebooked them regarding the problem and they respond with an automatic email that isn’t related to this issue. This is my dream trip and I want to make sure I do it right. As much as I would like to go in March I am scared if I don’t make the reservation in advance, I won’t be able to do the trek. I was wondering your thoughts and if you had any advice? I am not sure what year you went, but it seems as if it’s getting more popular and the park is harder to visit. I was planning to do the ” O circuit” March 25th to April 2nd. Hmm, I went right around that time 2 years ago and it was after the required permitting time, so I didn’t book anything in advance and I wasn’t required to. I never had any problems. I also carried my own gear so all I needed was a plot of ground for camping. That might be why. Next I would try calling them just to see if that works better. If you have a Spanish-speaking friend who can make the call for you that would be best. Hey there Kristin. You ROCK! You are such an inspiration! I really Love how you’re living your life….After all, we only get 1 life to live, and this one isn’t a dress rehearsal. I really appreciate all the work that you put into this site; there’s a wealth of information. It has helped much. My questions to you are more technical in nature. Is there a map showing distances between the various campsites? How about elevation deltas? A Topo map would be helpful too. This info would help me enormously. I am a real backpacker who regular goes backpacking in the woods on multi-day trips, without and sort of campsite or support. I always follow the “Leave no trace” guidelines. In reading your blog here, its too bad that I won’t be allowed to camp out in the “Bush”. Have you heard of anyone “Ghost” or “Stealth” camping in the park? As for bush camping: The reason why they’re not OK with it is two major fires that were caused by campers in the past. They both devastated the park and you can still see the evidence of both when you hike. They only want people to camp and cook in designated areas – the wind is just too strong and if one thing goes wrong it becomes unmanageable very quickly. Fair enough, right? Thanks for the kind words by the way! 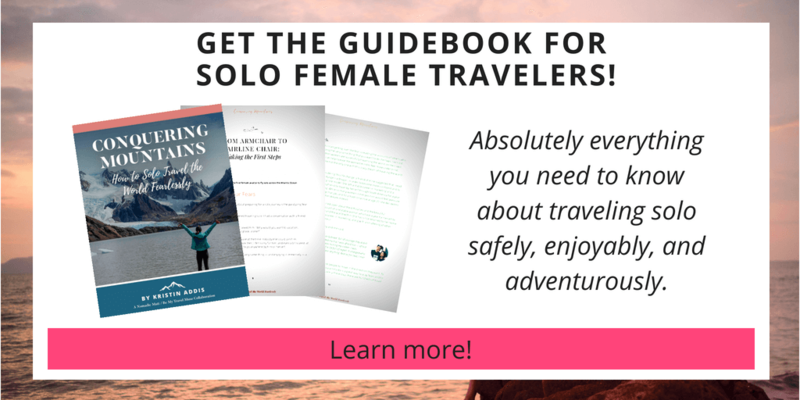 Your solo female travel blog is incredibly helpful for an aspiring solo female trekker like myself! I’ve been on a couple of journeys solo and have recently booked a trip down to Patagonia to tackle the O Circuit from April 3-10, 2018. I’ve emailed Vertice Patagonia (one of the campamento booking websites), and they told me that all of their campsites typically on the O circuit will be closed by the end of March. I’m worried 🙁 Does this mean I can no longer plan to do the full O itinerary? Or is there a way you know of to still go for it? Weird – I went at the end of March. I know it’s weather dependent of course but it’s possible you might want to move it up a week or two if you can just to be sure. 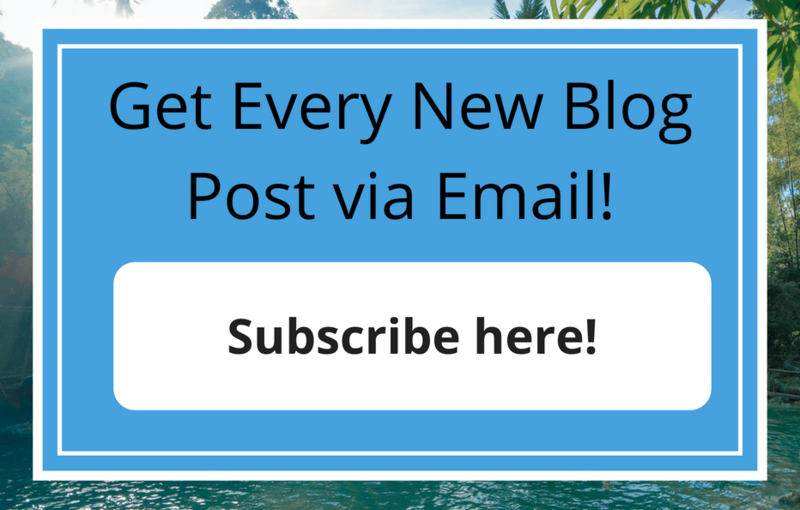 What an awesome blog post! So grateful for your effort in sharing this knowledge. My parent and I are new to hiking but will be doing the W in mid April. I’ve not been able to find the answer to this (perhaps naive) question – should we have a plan for what to do if a blizzard comes through when we are between Refugios? We won’t have a tent so are concerned about safety planning. Is this likely to happen and if so, what would be the general way to handle it? Thanks in advance! Usually you’ll get delayed. If it’s more severe I’m not actually sure. Hi! How safe is it to do the W trek as a woman alone? How can I find accommodation along the trek if I want to avoir camping? Stored them at the Hotel Las Torres where I stayed after the hike. They have a storage room. Otherwise store in town at the guesthouse you stay at before your trek and obviously book them for after as well to make it worth it for them to store your stuff. I’m doing the full circuit at the end of December-January; plan is to stay at the Hotel Las Torres afterwards – do they let you store your things there for free if you are staying with them? I also have a guesthouse that I’m staying at before/after that I could keep the gear. Finally – what excursions did you take at the Hotel? Definitely want to include horseback riding but also looking at your pictures – I want to see those views and the waterfalls. Suggestions? We are planning on doing the W trek in the first week in november. We are looking at camping as an option of accommodation instead of the refugios. Would you recommended camping or would it be very cold with one sleeping bag. If you have a sleeping bag that can handle it then you’re good! If you go with the hotel las torres you can take horses for part of it as well. You have to camp in designated camping areas. If you skip I suppose that’s proof to them that you camped outside of a designated area and yes they are VERY strict about that because they’ve had two massive fires in the parks in the past from people cooking and now everyone has to cook in the same sheltered area to prevent it from happening again. They limit numbers because there’s only so much space and facilities. It gets more popular and harder to get camping spots each year unfortunately. HI! The photos are amaaaaazing! I’m planning to do this, is there enough wood on the trek so I can be OK with a twig stove? That’s a huge no-no in TdP. They’ve had two massive fires so nobody is allowed to cook outside of the cooking areas in camps and it has to be a gas stove. In general in Patagonia you can’t burn any wood you find since there’s not enough of it to regenerate the topsoil if it gets burned, plus the wind is so crazy fires get out of control really fast. Hope that helps! What an amazing article ! I have a question regarding the places that are only accessible by car. We are doing the W circuit from Refugio Grey to hotel las torres. We would like to go to the campground Pehoe after that and do some day hike around there (or wherever it’s beautiful) but we were wondering how we can do it if we arrive by bus the first day. Renting a car from Puerto Natales on day 1 and leave it there for 5 days without using it seems expensive just to have freedom a couple days after the W circuit. Do we have other options ? You can probably book a day tour in town which might be cheaper, camp overnight there, then get transport to wherever you want to start hiking the next day. i m intending to do the O in March 2018. Is it possible to stay at a place for 2 days or even longer? Im 66 then but in a good condition. .
Should be, you just have to book ahead of time. which places are worth staying for more than 1 night? I would personally finish the trek then stay at the Hotel Las Torres for more than one night. how many rainy days did you have? Are the bookingpages reliable? It rains almost daily but it comes and goes. That’s Patagonia! Thank you so much for sharing this! It’s really helpful. Just a question, if we want to travel on November of next year. When would recommend to start booking campsites? I cant seem to figure out if you can just book anytime for the 2019-2020 season now or there’s a specific time when you can start booking for the 2019-2020 season? That I’d ask the companies directly for info on since I’m really not sure about when to book and the best timing. That changes all the time. Hi there, I am doing TDP O circuit in March. Did you prepacked your meal at home before you travel in Chile, did you had any problem getting them check in the airport. I planned to dehydrate my own meal to be cost effective. Do you have any recommendations? I’d be careful with that because they’re super strict about bringing food into the country. Any meat, vegetables, cheese, etc. is not allowed. I recommend buying food locally. I’m not sure it’s really that much more than at home to be honest. Hi Kristin! A year and a half ago, having just come off the Inca Trail, I googled best treks in the world and came upon your Torres del Paine post. I can’t even count the number of times my sister and I read this post as we prepared for the O Circuit. We just completed it 3 weeks ago and it was one of the most incredible experiences! Your advice and input was spot on. 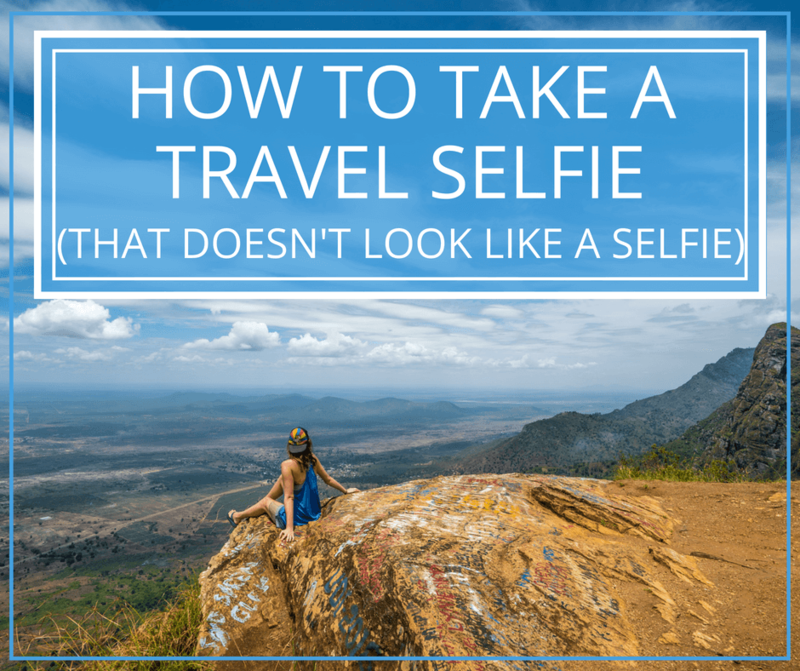 I enjoy following your blog and your Instagram, thanks for sharing your travel stories! Yayyyy that’s awesome! So lovely to hear that. Thank you for coming back to comment and letting me know!! Thank you for the wonderful details and inspiration. I would like to save money by camping and bringing my own gear on the O trek. However, is it necessary to bring gas canisters and a small grill for cooking? Is there any chance the refugios simply provide hot water so that I can rehydrate/cook instant meals? Hi Rachel! Glad you like the post. I think you probably should bring your own grill and canister. Some might be happy to provide hot water but if any of them can’t or say no, then you’ll be in a tough situation. You might be able to ask others in camp but remember that would be using fuel they carried and they might not have enough to share.